Look it’s me! We stayed nice and cozy inside this weekend while it was freezing outside!…..well, we did venture outside to play in the snow a little bit….and once for donuts…you know, the important stuff. Anyway, let’s talk about one of my most favorite things….mason jars. They are scattered in almost every room of my house….I just can’t get enough! Most of them were my grandma’s, so they hold a special place in my heart. So does my new necklace from JustJaynes. 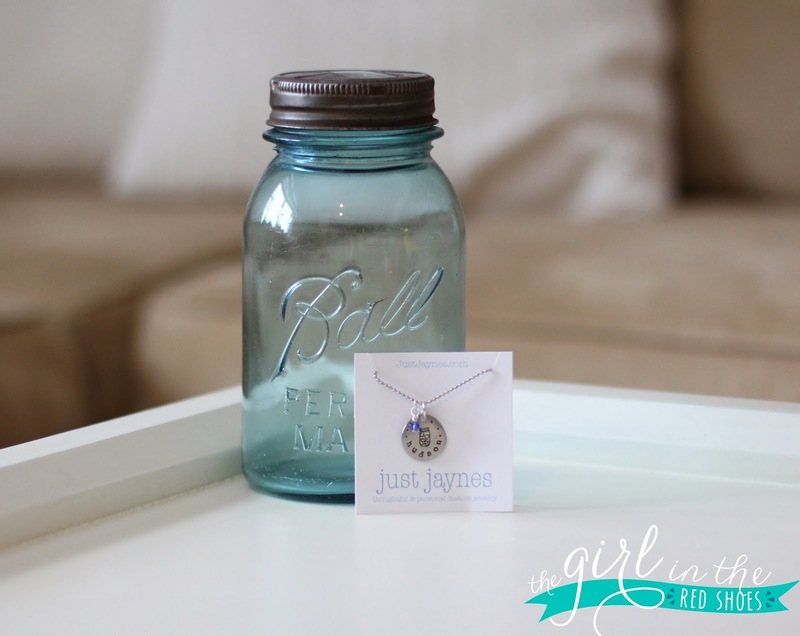 Cathy from JustJaynes sent me the most adorable mason jar necklace with Hudson’s name on it. Let’s zoom in a little closer…. Mason jar filled with hearts AND my most special boy’s name on it….I mean, could it get any better? It’s my new favorite accessory, that’s for sure! I love having Hudson’s name close to my heart all day…..isn’t being a mama just the best? Want a necklace like mine? Cathy has generously offered to give one lucky The Girl in the Red Shoes reader a $40 shop credit! Read on for details! 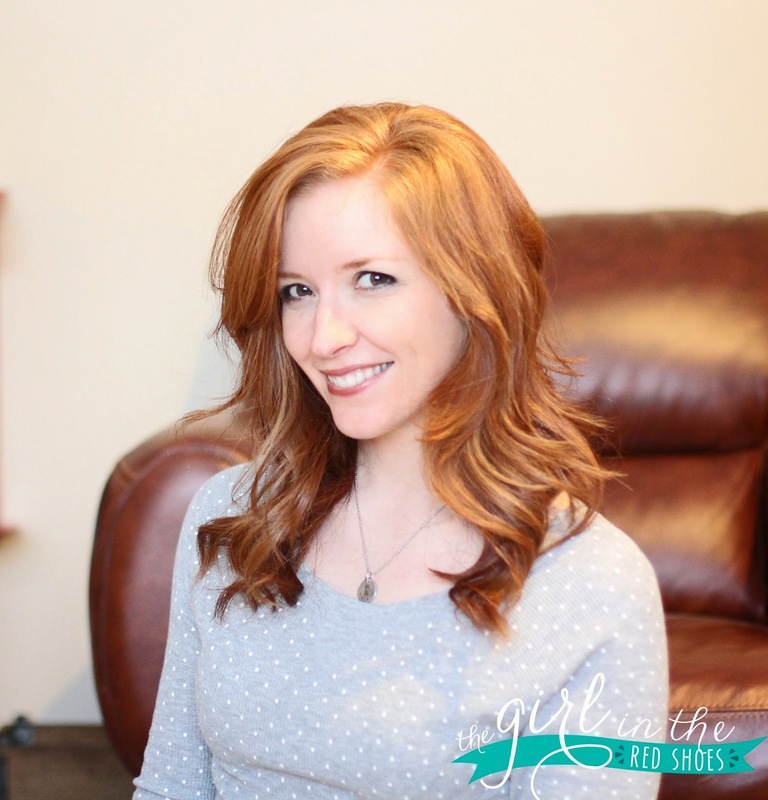 Meet Cathy of JustJaynes, jewelry-maker extraordinaire! Cathy started making and selling jewelry in 2005 while working a full time job. Jewelry making started out as a hobby, then grew into a part time job (while still working full time). Around Christmas 2009, her employer and her split ways, and JustJaynes became her full time gig. 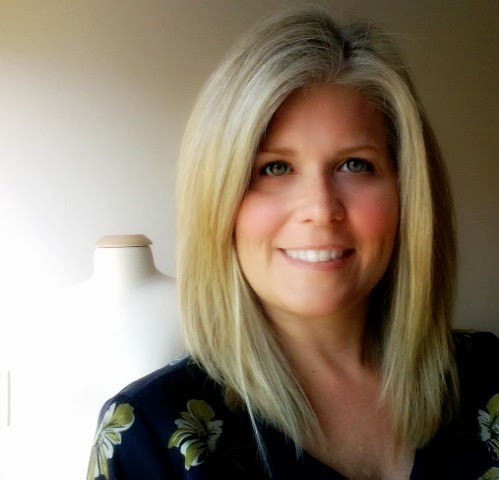 She was able to focus on the jewelry business and grow her line of thoughtful & personal jewelry, which now includes necklace, bracelets, and rings. Cathy is also a wife, mom to two fur-babies, three-season runner, golfer, and fisher-lady. Her love for her pets, family, and running has inspired some of her best-selling necklaces. Isn’t her jewelry beautiful? Enter to win a $40 shop credit to JustJaynes below! Beautiful!! I love the initial necklace and the "two name" necklace…for future babies of course 😉 Great giveaway!! I love the jar of hearts with the initial necklace! Everything is so beautiful! 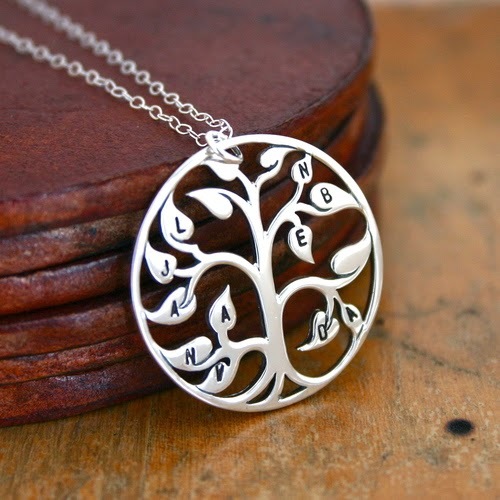 I love the Sterling Silver Initial Necklace With Stamping! I love the Family necklace with the freshwater pearl! Her jewelry is so cute! It's hard to pick but I think I like the simple little circle initial necklace the best. I like the Pewter Heart Necklace with Two Names and Birthstones! Yours is sooo cute and I love your hair! I love the family necklace with the freshwater pearl! So cute! oh my gosh I love these necklaces!!! I also have mason jars in every room in my house. My favorite from her shop would be the mason jar necklace with the initial charm and I also like the single charm with the half marathon charm. Thanks so much for hosting this amazing giveaway!!! Cathy picked the perfect necklace for you. Love It. What adorable jewelry!!! Thank you so much for sharing!! 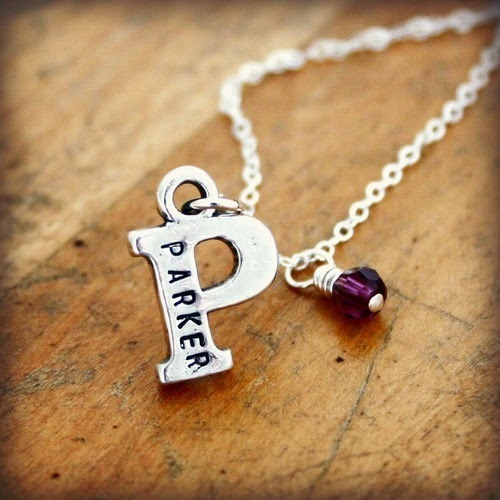 Sterling Silver Initial Necklace is on my birthday list for sure!! How adorable! I'm in LOVE with the jar of hearts with initial pendants! So stinkin' cute! I love the family jar of hearts with the freshwater pearl!! So unique!! Oh my goodness it is so hard to choose!! I like the two names and birthstone. It would be perfect for each of my babies! I also have to say that as a fellow ginger (& Julie too) I LOVE your hair! Your latest cut is inspiring me, after the wedding of course, to do something similar. Love your blog! SO cute! I love the necklace but I have been wanting a ring with my son's name on it (it will be much harder for him to yank a ring off than a necklace :)). I like her personalized rings! I love the mason jar necklace that you got! What a lovely necklace! So cute. Her stuff is great – I love the 'love' ring, and the peacock earrings too…so many…and the antler necklace, and the heart necklace. You didn't mean just one favourite, right?! I love the LEATHER WRAP BRACELET WITH FAITH CHARM! Thank you so much! The Family Tree necklace is my favorite! Gorgeous pieces. I love the two-toned sideways cross! So beautiful, great meaning and more unique than a typical cross. So cute and delicate! I would use the credit to get two small initial necklaces with my kids' initials and layer them. I love the infinity necklace and the love ring! They are all so pretty! I love the initial and wishbone necklaces! I LOVE the jar of hearts necklace! It's so simple yet so sweet! I love the zodiac constellation necklace! I like clean and simple and I really like the initial necklaces because of that! Love the wishbone necklace! I also love the mens leather wallets, they would make a great Valentine's day gift! Hard to choose, but I love the sideways cross necklace. i absolutely adore the ring with the quote 'she believed she could so she did'! perfect for the start of an awesome year. thanks for the chance to win! I love the sterling silver arrow necklace! So cute!! So pretty. I love the round initial necklace! I adore the initials necklace so very much!!! Her jewelry is so pretty! My favorite is the mason jar necklace as well! So pretty!!! 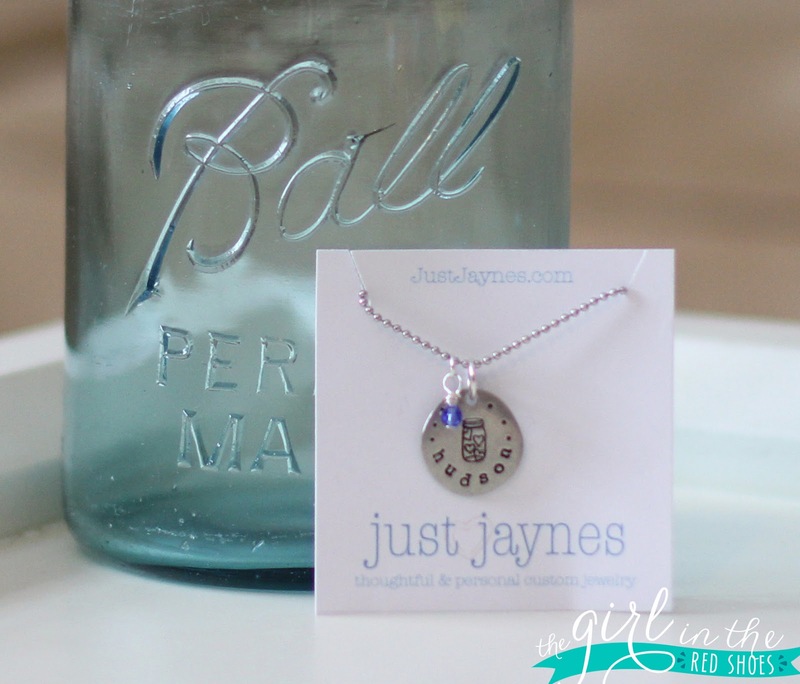 I love the jar of hearts necklace with the small initials! It would be a perfect way to carry all 3 of my children with me! The leather bracelets with customized words! I would totally pair the "With Brave Wings She Flies" charm with the "26.2" charm, since I just completed my first marathon! And of course I also love all the different charms with Mason jars! I love the Pewter Family Necklace with Freshwater Pearl. Just adorable! I love the mason jar necklace as well! I also really like the name with the little heart. i love the initial necklace…but all of them are beautiful! Love the wishbone necklace and the tree of life! I love it all but the mason jar necklace is definitely my favorite! I LOVE the Jar of Love for You necklace but if love to have all my kiddos birthstones on it:)! Awesome and one of a kind treasures:)! I LOVE the jar of hearts with the letter initial. This is especially meaningful to me as my son's name is Mason. So I get the mason jar of hearts as well as an m for my Mason and it's perfect! The Sterling Silver Infinity Necklace is simply beautiful! Colorful Crystal Leather Wrap Bracelet…omg so much to choose from though! I also love the Turquoise and Sterling Silver Dangle Earrings…so simple and cute! Everything is beautiful! I think i like the jar of hearts with the initial the best. Too hard to choose! Love the customizable wrap leather bracelet! Love the inspirational leather bracelet!